HollywoodChicago.com was on the Red Carpet at the event, and got to briefly interact with vivacious Ms. V, who also was promoting her current film, “My Life in Ruins” with her co-star Alexis Georgoulis. Nia Vardalos at the Gabby Awards, Chicago, June 19, 2009. HollywoodChicago.com: You are one of the notable graduates from Chicago’s Second City troupe. What lesson or lessons from those years has sustained you in your career? 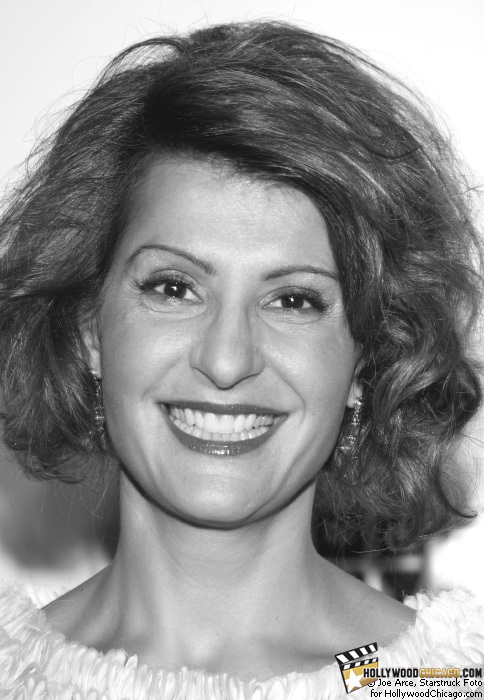 Nia Vardalos: There is no crying in comedy (laughs). You’ve got to be tough, and the Windy City sure teaches you that when that wind takes you, push back. Nia Vardalos on the Red Carpet at the Gabby Awards, Chicago, June 19, 2009. HC: One of the legends of “Greek Wedding” is that you pioneered a type of hyper-local marketing, literally building an audience town by town, screening by screening. Do you think that type of promotion is less possible now or can it still work? NV: I think it is less possible now because the theater owners gave us a long time to hold ‘My Big Fat Greek Wedding’ and now you have less of a chance to do that. We now have to urge people to go to a film early in the run, but when you’re up against goliath films it’s a little more difficult. But at the same time you can’t stop making little movies. We do what we can. We put them out there, if people find them, great, if not there is always the DVD release. 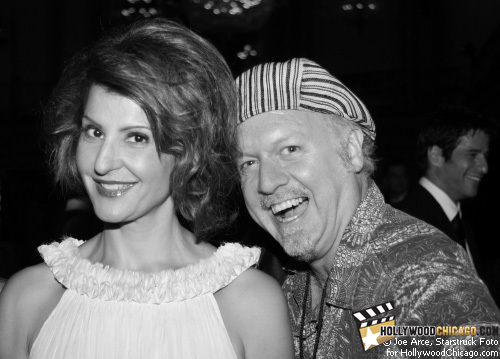 Nia Vardalos and Patrick McDonald, Chicago, June 19, 2009. HC: You are a notable columnist for ‘The Huffington Post’. What do you find most different in blogging versus doing screenplay or stage writing? NV: You know what I love about blogging? It’s actually less difficult because nobody edits you on The Huffington Post and on Anderson Cooper, no editing. I wrote a piece for Arianna [Huffington] titled ‘The List’ and a second piece for Anderson Cooper called ‘What’s the Big Fat Deal’. They are not like a studio, that’s for sure. It was like my first screenplay, nobody edited it. HC: You are probably one of the most representative members of the Greek heritage. How has it informed through your career and your philosophy? NV: Not to compare myself, but like Robert DeNiro and Martin Scorsese, I like to explore my heritage. My next movie, ‘I Hate Valentine’s Day’ has nothing to do with a Greek holiday, but I figure since I’ve got this nose (laughs), I want to tell Greek stories. Nia Vardalos current film is ‘My Life in Ruins’. Check local theaters for showtimes. Read the HollywoodChicago.com interview with “My Life in Ruins” co-star Alexis Georgoulis.